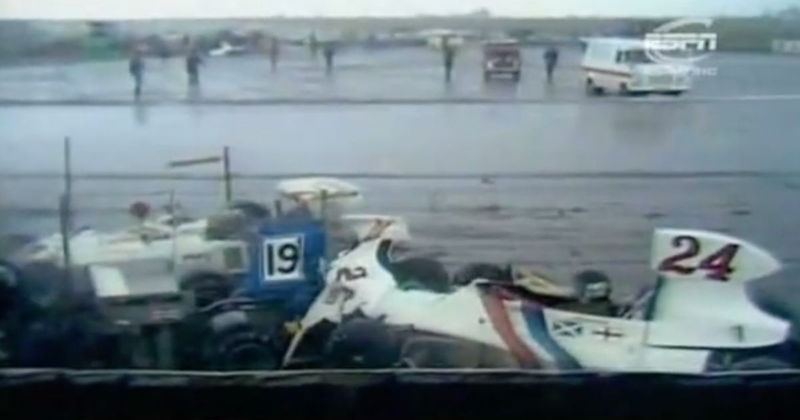 The 1975 British GP at Silverstone was something of a crazy race. Wet/dry conditions saw eight lead changes between seven different drivers, with Emerson Fittipaldi eventually finding himself and his McLaren M23 at the front and looking strong. However, although the track had dried after earlier rain, on lap 53 a freak hail storm soaked the track almost instantly and drivers couldn’t stop aquaplaning off at the Woodcote chicane. Most of the action was even caught on camera, which also shows off plenty of the state-of-the-art 1970s safety standards. Here are the 13 drivers who went off as a result (deep breath! ): James Hunt, Jody Scheckter, Patrick Depailler, Jochen Mass, Carlos Pace, Mark Donohue, Tony Brise, John Watson, Brian Henton, Jean-Pierre Jarier, Dave Morgan, John Nicholson and Emerson’s brother, Wilson Fittipaldi. Emerson had cleverly pitted for wet tyres and, since all of his closest rivals were caught in the catch fencing, was declared the winner when the red flag was shown on lap 56. There were no countback rules back then so Fittipaldi won from Pace and Scheckter, even though they were in the wall, because the only other cars still running (aside from Fittipaldi) were more than a lap behind. Those other drivers who didn’t crash were Vittorio Brambilla, Niki Lauda, Alan Jones, Mario Andretti and Clay Regazzoni. Although he was only 29 at the time and still the reigning world champion, this would turn out to be Emerson’s last F1 victory. From 1976 to 1980 he made the disastrous call to race for his own Fittipaldi team, which yielded no more than a couple of podiums in largely uncompetitive cars.